BacPac's client/server architecture provides for backup of local disks to remote tape drives and/or disks, as well as backup of remote disks to local tape drives or disks. Both image and incremental mode are supported. All other BacPac options are also supported including listing of remote tapes, selective restore of files from remote tapes to local disks, and restore of files from local tapes to remote disks. All data is transferred from node to node over TCP/IP or DECnet links with optional data compression to minimize transfer time. 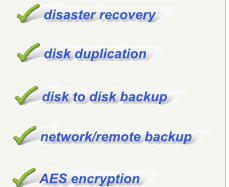 In the diagram above, the Production Site has disks to be backed up. BacPac is installed on both nodes. If you are logged onto the Production Site, the command to backup disk-1 on Node B would be: If you are logged onto the Backup Site, the same operation could be performed using the following command: The commands are all the same as local BacPac with the exception of the node name. Compression will take place on the node where the files reside, regardless of which node the command is issued from. The data that is transferred across the network is always compressed, reducing network traffic and transfer time.